In Victorian England, artists painted an abundance of portraits of Ophelia; many of them perhaps inspired by one of the most famous paintings of the Pre-Raphaelite movement, John Everett Millais’s 1850s depiction of Ophelia. This selective chronological review shows the evolution of artistic ideas about the well-known character from Shakespeare’s Hamlet as each of the following paintings presents a freeze-frame of one single moment from Ophelia’s life or death in which she must be observed and analyzed based solely on her physical appearance and the appearance of her surroundings. 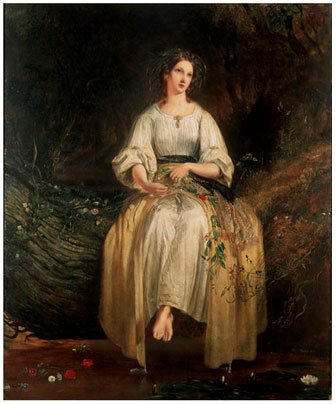 In Richard Redgrave’s 1842 painting, Ophelia and her flowers provide the only strong colors in an otherwise dull, brown landscape. The white and gold clothes resemble her purity and innocence. The red in the water resembles blood, a colour physically connected to Ophelia as red poppies drop from her lap and into the water. Poppies were considered a highly symbolic flower in England in the 1840s because, in the early nineteenth century, scarlet corn poppies grew over the battlefields from the Napoleonic Wars. As a consequence of this, red poppies became a symbol of death. The roving eyes of Redgrave’s Ophelia also give her a sense of restlessness. By far the most well-known painting of Ophelia is John Everett Millais’ 1852 depiction of a moment shortly before her death. Millais’s fellow Pre-Raphaelite artist William Holman Hunt wrote about the purpose of Pre-Raphaelite art, opining of the artworks that preceded it that ‘their most frequent offence in my eyes was the substitution of inane prettiness for beauty […] Pictured waxworks playing the part of human beings provoked me […] What I sought was the power of undying appeal to the hearts of living men. Much of the favourite art left the inner self untouched’. John Everett Millais, Ophelia, c.1852. Photo: © Tate, London, 2017. Distress is most visible in the face of Millais’s Ophelia, of all the paintings in this collection, reflecting Hunt’s words about the focus on the inner self in Pre-Raphaelite art. This is partly because Millais’s extreme detail and very precise brush strokes allow for greater photorealism in his paintings than in those of most of his contemporaries. The vivid color also seems celebratory, with Ophelia’s surroundings appearing either ignorant of her death or unfeeling towards her. The darkness in this painting comes from the black water, which seems to be swallowing her as well as dragging the colorful flowers out of her hands; Millais shows us bright color drawn away from her as she is consumed by this darkness. In contrast to Redgrave and Millais, Arthur Hughes depicts Ophelia as a young, waif-like figure. Instead of colorful flowers, this Ophelia’s garland resembles a crown of thorns, a biblical image of the martyrdom of an innocent. 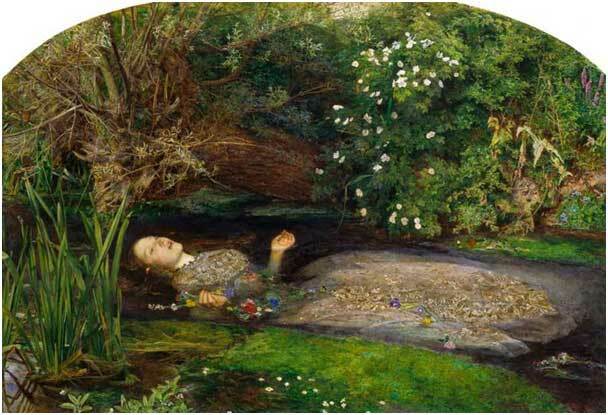 The appearance of Hughes’ Ophelia seems more like that of a child than a young adult. Thomas Francis Dicksee, Ophelia, 1873. Within portraits of Ophelia created after Millais’s painting, it is easy to notice other artists looking to Millais for inspiration. Thomas Francis Dicksee’s Ophelia has the long red hair of the Pre-Raphaelite muses, crowned with colorful flowers. 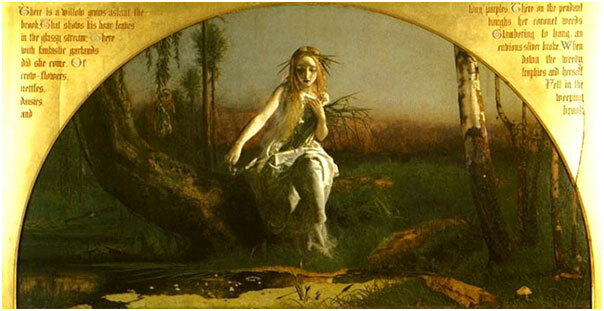 In Dicksee’s painting, Ophelia has removed her crown of wildflowers, she sits on a part of the riverbank covered in dead vegetation, again in a white dress, the bottom of which has already begun to be soiled by the muddy water. The contact between her dress and the water hints at what is to come as the river seems to be clutching at her clothes. The slight reflection of Ophelia suggests that, were she to look down, she would see a ghostly image of herself in the water already. John William Waterhouse, Untitled [Ophelia], 1894. John William Waterhouse, Untitled [Ophelia], 1910. John William Waterhouse’s vividly colorful paintings of Ophelia were also inspired by the beautiful women of Pre-Raphaelite art. The wide, scared eyes of Ophelia in Waterhouse’s 1910 painting particularly demonstrate that, like Millais, Waterhouse was concerned with creating a visual image that reflects the workings of Ophelia’s mind rather than the ‘inane prettiness’ that Hunt accused earlier nineteenth-century artists of depicting. In both of these Waterhouse paintings, Ophelia is not in the water and is looking away from the river. 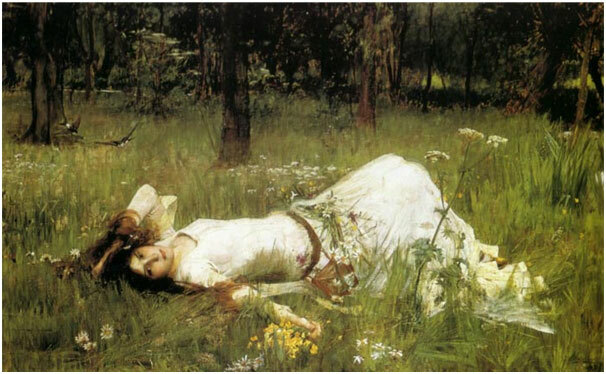 In both paintings, as well as in Waterhouse’s earlier 1889 painting of Ophelia lying contently in a field, her life does not appear to be in danger. This is enhanced in Waterhouse’s 1910 painting as Ophelia is not alone: a person watches her from a raised platform or bridge. John William Waterhouse, Untitled [Ophelia], 1889. 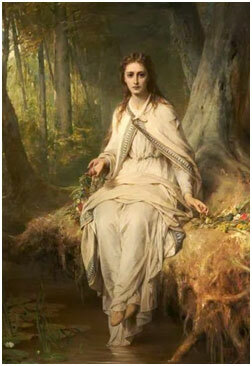 In most of these paintings, Ophelia wears a blue or white dress; these are iconic colors of innocence and virginity. White is the traditional color of a bride’s wedding dress and blue is the most common color worn by the Virgin Mary in art, a tradition which dates back to the fifth century AD. The water in all of these paintings is black, the color of darkness and nothingness; brown, the color of a grave; and red, the color of blood. Generally, these paintings capture only a limited, subtle sense of an active threat to Ophelia’s life, focusing instead on her innocence and drawing on the beautiful and poetic description that Gertrude gives of her death. The Ophelias painted by Dicksee and Waterhouse look directly out to their observers, seemingly aware that they are being watched and perhaps inviting observation. The medium of fine art places all of these Ophelias as objects for observation and these observations focus primarily on her youth, beauty, and innocence. This raises the question of whether such focuses emphasize or override the tragedy of her wasted life. Much of the tragedy within these paintings exists in the knowledge that these images take place moments before her death, something to which these artists allude in their paintings but, with the exception of Millais, do not directly address. Implications of Ophelia’s imminent death include bright flowers falling from her hands and the dark and threatening water grabbing at the edges of her dress. In a manner that reflects the Pre-Raphaelite influence on late nineteenth-century English art, these artists searched for various ways to paint the beauty of Gertrude’s description of Ophelia’s death while also finding a visual connection between the physical appearance and the mind of Ophelia, placing her life, youth, and beauty in opposition to her death. Although these paintings may seem to show Ophelia’s death as purely romantic and beautiful on first appearance, the subtler indications of danger, tragedy, and fear are plentiful. Rachel Stewart is studying at The Shakespeare Institute, University of Birmingham, where she recently submitted her PhD on the performance history of madness in Hamlet. She also holds an MA in Shakespeare and Theatre from The Shakespeare Institute.